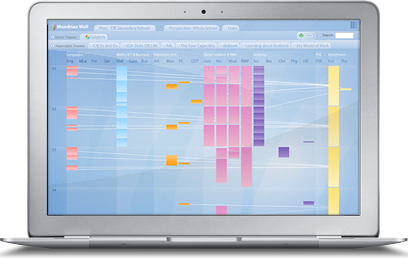 The Mondrian Wall is an innovative application created by Sequential to actively progress your school’s improvement plans through visual, dynamic and holistic curriculum planning. 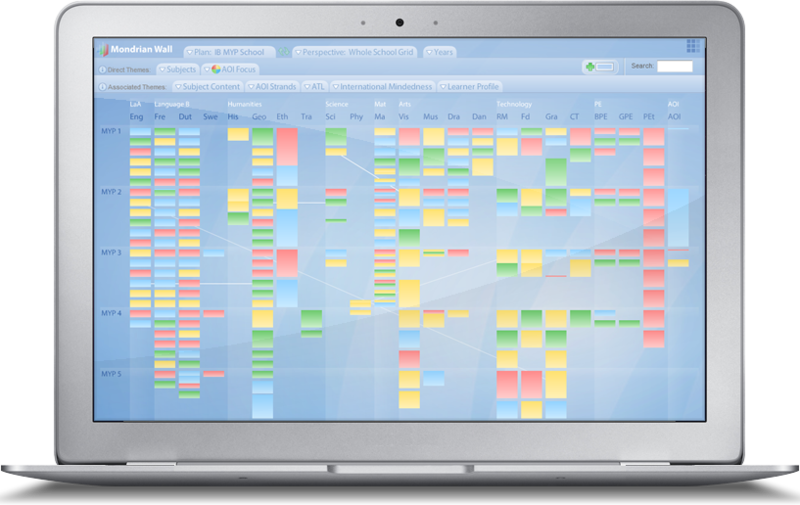 By mapping units or schemes of work onto a dynamic visual grid, the Mondrian Wall shows you what is being taught and when. The interface visualises interdisciplinary links and collaborations and using simple colour coding, skills, themes and pedagogical approaches are highlighted across disciplines. Released from disparate spreadsheets or bits of paper locked in cabinets, your curriculum becomes quick and intuitive to navigate and fun to explore. An experienced Education Identity Advisor works closely with individual schools to understand their needs to design and set-up custom Mondrian Wall plans and create a tailored Mondrian Wall implementation strategy. This process continues beyond the launch - the Mondrian Wall is flexible and adaptable because your needs will change over time. Every aspect of the Mondrian Wall can be customised for each school. 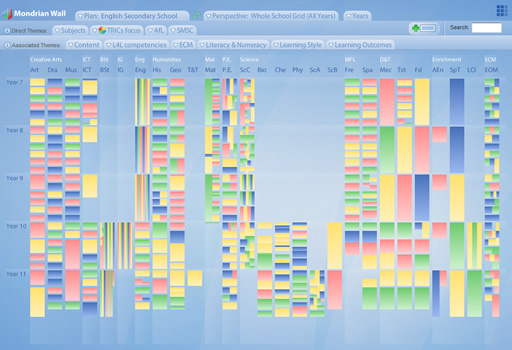 So, as a result, a school's Mondrian Wall whole school view is like a unique, colourful, Education Identity fingerprint! 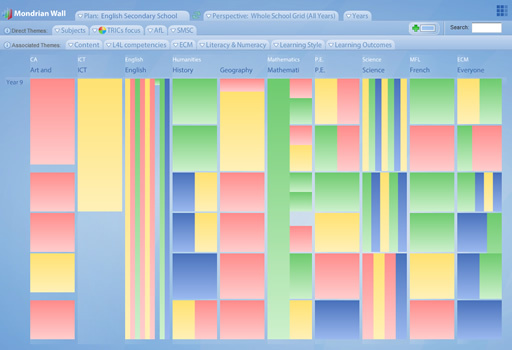 The Mondrian Wall is being used to map and plan frameworks and themes such as GCSE, English National Curriculum, SMSC, iGCSE, A-Level, IB (PYP, MYP, DP and CC), International Mindedness, AOI, Concepts, CfE (Es & Os, SALs), Skills (such as PLTS, TRICS, SfLLW and in-house Skills), FOSIL (Information Literacy), AfL and much more. 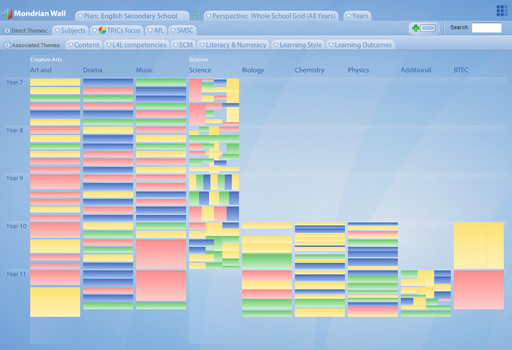 By showing the whole school curriculum on one screen, the Mondrian Wall gives an instant visual overview, but easy interaction enables users to quickly drill down from a high level view to individual unit detail. There are multiple ‘views’ available which, along with instant searching, filtering, time-frame and subject selection, provide a variety of perspectives. The beauty of the Mondrian Wall is in its simplicity. Curriculum planning no longer has to be a daunting administrative task that only benefits school leaders or departmental heads. The Mondrian Wall enables high level curriculum mapping that all teachers, and even their students, can be involved in and benefit from. The Mondrian Wall is live and easy to update - so it enables regular, incremental updates rather than sporadic reviews. Discover opportunities for interdisciplinary teamwork - then map and visualise links as they grow and develop. Forget about fiddling with spreadsheets: consistent structures mean you can focus on optimised planning. 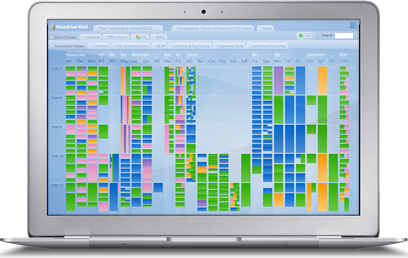 Curriculum planning no longer has to be the daunting administrative task of managing static data locked as bits of paper in drawers, spreadsheets in each department or caged in a timetable. With the Mondrian Wall, you can bring your whole school curriculum to life - make it more relevant, targeted and tailored to your school’s ethos, challenges and ideology (whilst still taking advantage of the resources and experiences you already have). Instantly analyse and evaluate your curriculum 24/7 and bypass initial fact-finding efforts and meetings. Integrate enrichment and holistic development into your dynamic curriculum and develop your school's ethos. 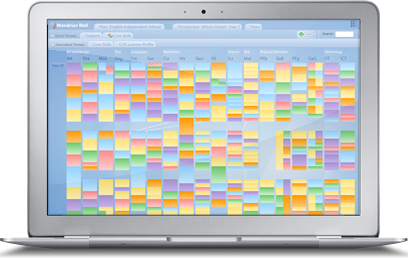 Mondrian Wall Insight shows user usage information and provides new ways to evaluate your curriculum. Chat with an experienced Education Identity Advisor and find out how the Mondrian Wall can help you and your school.